Sometimes I save a recipe and it takes years for me to get around to making it. Most I’ve never made and probably will never make, despite my best intentions. And sometimes a recipe finds me at just the right moment, like this one, when I’m craving it, or I happen to have everything needed to make it. This soup really is quite effortless. 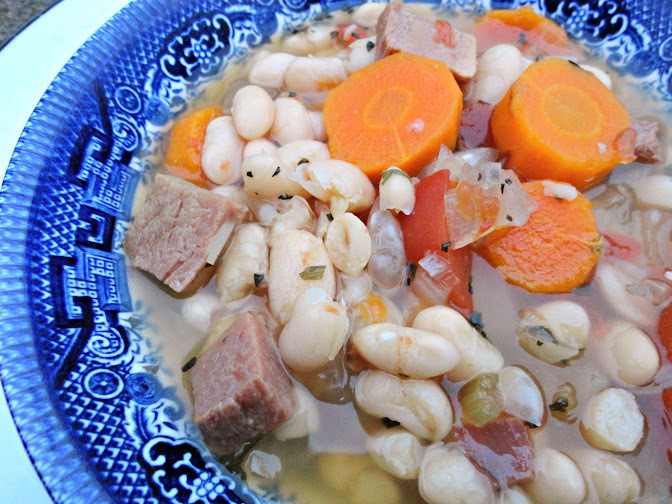 Mary’s recipe is easy to begin with, as it is made in the slow cooker, but I cut out the step of soaking the beans overnight and now it’s even easier! When I make refried beans in the slow cooker, I don’t soak them overnight and the beans cook up just fine and soft without the soak, so I just used the same amount of water for the soup as if I was making refried beans and it worked great. In a large crockpot, combine all the ingredients and cook on low for 8 hours. Mash some of the beans to make the soup creamier if desired. Serve hot. Posted in Slow-Cooker/Crockpot, Soups & Stews. Bookmark the permalink. Talk about the warming and delicious stew! Perfect for the lousy rainy weather we have over here. I always crave soups & stews on cold & rainy/snow days. Biz directed me to your blog after I asked about good blogs to read and follow and yes, I like your blog. I love cooking too but I live in Holland and we have different measurements so recalculating everything is too much time. Besides that I have about 90 cook books and way too many recipes to make them the rest of my life :) But I love reading about food and sometimes I see recipes on English blogs that I have in Dutch somewhere and I can make my own version. Feel free to visit my blog if you have the time and feel like it. The book sounds like a great read, I’m off to look into it, thank you ! Veronica- my daughter (who is in college in KC) likes to use a crockpot for cooking suppers for her boyfriend and herself. She just asked me this weekend how to make ham & beans in her crockpot. Perfect that you posted this today! I sent her the link to your recipe. She’s going to love it! 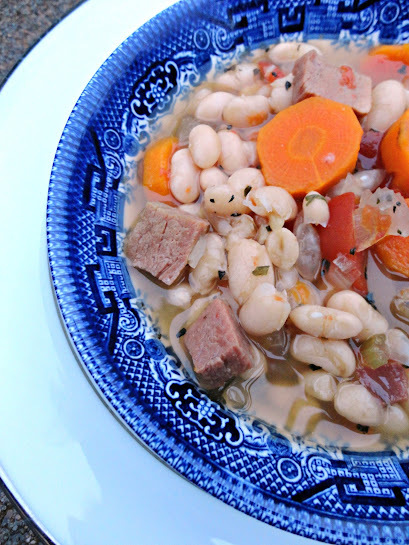 We like to take the Christmas ham and make New Years beans and this recipe will be something to look forward to at my house. I’ll let you know if my daughter has success with this (which I am sure she will). My crockpot is new and I’ve discovered it cooks a lot faster than my 1980s crockpot, which takes TWO days to cook a roast (no joke). I wouldn’t try to cook them without soaking first if she’s using an old crock pot. You should know, Mary, it’s your recipe! lol! Yup, nothing warms the soul like hot soup on a frigid day. My favorite ham and bean is more simple, without the tomatoes and spices. 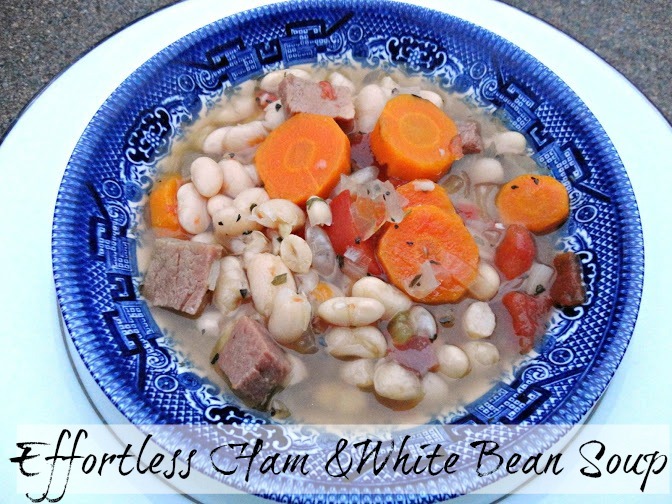 I just like the beans and ham plain but Dennis liked this so I blogged it. Yup, it’s defnitely chilly, we had to turn on the heater a couple weeks ago! I was so mad-wanted to wait until later. Oh well! Did you say effortless and it looks this good? It’s summer down under but I could still enjoy a bowl of this. this looks so yummy. i haven’t had ham in soooo long. I’m super independent, so it was really hard for me to be “weak” and accept help from others during the times when I was very sick. This post reminded me to give thanks for all those who helped me out along the way, and thanks to God for giving me the humility and courage to accept them.